The Ultimate premium gift for your loved ones!!! in its quality stainless steel construction, chrome finish and superior design. your home kitchen or bar collection, as well as a unique gift idea. The cherry wood box makes it perfect for gift-giving or storing at home or office. Offer as a present at your next wedding or party; give as a gift for family and friends. With the enclosed recipe e-book BONUS, you're sure to be the talk of the party! There's a 30-day guarantee to ensure your complete satisfaction - or your money back! PREMIUM QUALITY - This precision-constructed wine corkscrew opener for wine bottles is made of the finest stainless steel and chrome finish. With its easy-to-use ergonomic design, it provides an excellent combination of form and function. PACKED WITH ACCESSORIES - Beautifully designed, the wine bottle opener corkscrew set is generously accessorized for your optimal convenience. Unique wine accessories include 2 wine stoppers, drip ring, foil cutter and extra corkscrew. 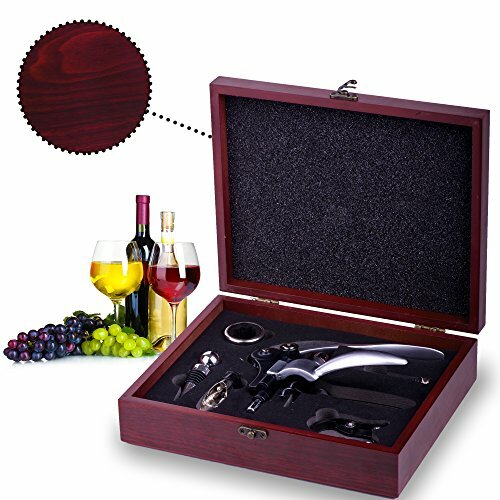 UNIQUE WINE GIFT IDEA - Packaged in a classy cognac-color cherry wood case, there's nothing like it for a wedding, anniversary, birthday or housewarming gift, or as a present to cultivate important business connections or donor relationships. Makes a great offering for the host of your next dinner party - with or without a bottle of wine in tow. PERFECTLY PRACTICAL - Wine lovers unite! Whether at home or on a picnic, the wine corkscrew set makes serving wine a breeze. Professional bartenders use it to maximum advantage, saving precious time. 30-DAY MONEY-BACK GUARANTEE ensures your RISK-FREE PURCHASE! And what's more, 10% of profits earned from your purchase are DONATED to causes helping children with cancer. If you have any questions about this product by Best 4 Chef (Best4Chef), contact us by completing and submitting the form below. If you are looking for a specif part number, please include it with your message.